Back to work this week, which helped me realise that taking time off work to move house is not as relaxing as lying on a sunny beach and reading a trashy novel while the waves slip invitingly between your toes. No, it was back to toiling in the dark, sunless archive mines, which resemble the fabled mines of Moria, only we get more trolls. Highlight of the week was when workmen came to fix the fire escape. We’re upstairs on the first floor, with a rickety metal staircase leading down to the ground outside; and apart from its rather daring instability in strong winds, in the winter it gets very slippery with leaves and moss, so that the unwary fire escapee can find themselves losing their footing and hurtling down on their backside like someone escaping a jet liner on a chute – with the added risk of not stopping at the bottom, but sailing nonchalantly down the hill to the harbour, and so on out to sea, eventually to fetch up in Norway. As far I could tell from the other side of the door, the repairs seemed mostly to consist of hitting the stairs with a hammer (or, judging from the periodic episodes of very inventive swearing), each other. There were times when it was closer to working in a metal foundry than an archive. At last they packed up and went home, so we decided to see what they’d done, only to find they’d somehow managed to jam our fire door shut – thus, I suppose, doing away with the need for a fire escape at all, a perfect solution in local government terms. I’ve included a picture of the view from my office window at work, because it’s lovely. 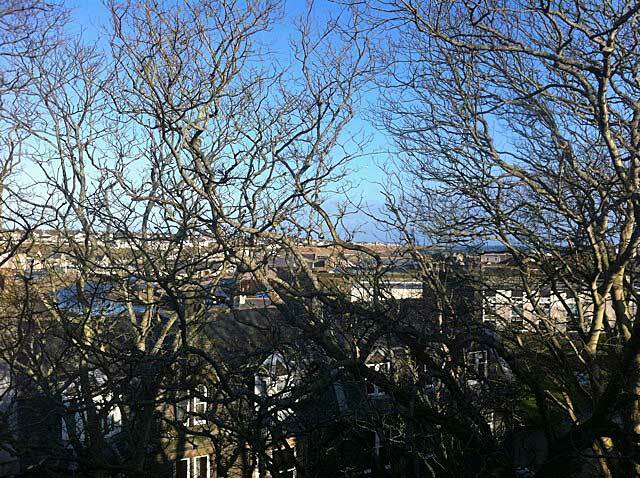 The camera focuses on the trees in the foreground, but it’s easier than it looks to see through them to the river (running through the town from left to right, to the harbour where the waves burst against the stone breakwaters in an effect like a fat man sneezing with a mouthful of milk). There are worse views in the world. In between unpacking boxes, working, and falling asleep in front of the television (my idea of a rich full life) I’ve also just about managed to keep up with the knitting. I try to manage 45-60 minutes a night, and as I work down the sleeve the decreases are starting to take effect, so each row feels a little shorter than the last. Wick being a gansey sort of place I was taken to task by one of our regular researchers, a sprightly young chap in his 80s, who fixed me with an ancient mariner sort of stare and asked me if I knew the origin of the word “gansey”. I gave him the usual spiel of the Elizabethan knitting industry in Guernsey, but he brushed that aside with the ease of a batsman clipping away a legside half-volley. No, he said, Guernsey was too small and insignificant for that. The real origin was from Scandinavia, where they refer to fishermen’s pullovers as “gansers”. So I was wondering if anyone had any thoughts on that? Is there really a Scandinavian tradition of “gansers” – or is that likely to be a corruption of our word, “gansey”? What do you think? Finally, there won’t be a blog next week – Margaret is escaping from Caithness to Edinburgh and London (she says she’s got some music event to go to, but I think she’s really off in search of Starbucks) and I have a certain amount of falling asleep in front of the TV to catch up on, so we will be returning on Monday 12th March. Look forward to catching up with you all then. I’ve always gone by the your old man’s theory, that the name comes from the old Scandinavian ‘genser’ for a sweater, and originally any knitted garments. KNitting was for hats and stockings first, then undergarments, and I think it was in Scandinavia that knitting originally came out in the open as sweaters as we know them. The island name Guernsey is a completely different original, some sort of a corruption of a personal name and the Norse for island. And then of course they ended up sounding and meaning the same thing – convergent evolution of a word. I’m another one who subscribes to the theory that ‘gansey’ derives from the Norwegian ‘genser’ for sweater or jumper. I grew up in Liverpool and my father, who came from a seafaring family, still routinely refers to any knitted jumper or sweater as a ‘gansey’ because that was what his family called them. He refers to the gansey I knitted last year for my brother as a ‘fisherman’s gansey’ so distinguishing it from other styles of gansey. My mother also comes from a seafaring family but one that has its origins in Devon and the term gansey was not one that she was familiar with in her childhood. Liverpool has strong Scandinavian connections and there are other words in common usage which also have Scandinavian origins – including Scouse itself (the stew not the inhabitant!) which is derived from lob/labskaus variants of which are to be found throughout Scandinavia and the Baltic region. 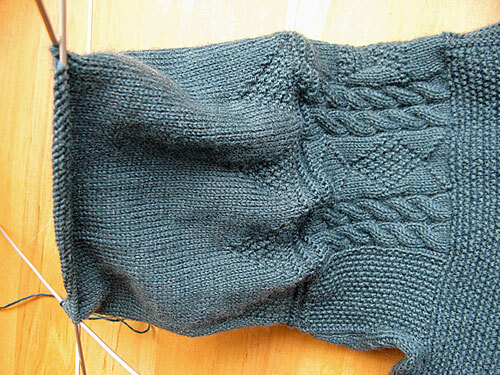 PS Gordon, the gansey/genser is looking really good too – it’s always great when you get to the sleeves and progress suddenly seems to become really rapid doesn’t it? 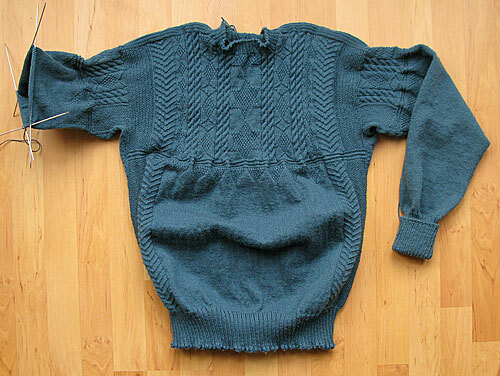 In my opinion, the term “gansey” or “guernsey” for a sweater does come from Guernsey, simply because there is a corresponding word “Jersey” which also refers to a knitted sweater, and the two words were both previously used for the tightly twisted yarn that came from those islands (Queen Elizabeth’s Wardrobe Unlock’d) and even combined into a portmaneau word, “jarnsey”. Without getting into the history of the garment as opposed to the name attached to it… I believe the term gansey for a knitted upper-body garment was in use quite early in the 19th century. Although Felkin published in 1867, he was involved in the framework knitting industry from the age of 13 in 1808. Henson and Felkin both drew from records kept since the 17th century by the framework knitting guilds. I believe there is a quotation from one of them in The Old Hand-Knitters of the Dales about ganseys being knitted commercially (page 94, circa 1826). The Manuel des Demoiselles ou Arts et Métiers, 1830 edition, is on Googlebooks. Page 192 begins a section including “ganse” which appears to mean a kind of twisted cord. I wonder whether there is any connection between that and the word “gansey” – could it be that two words collided, French “ganse” and Channel Islands dialect “Guernsey”? Hi Tamar, I always thought that jerseys were called jerseys because they were made with jersey cloth, that is, they were made from manufactured knitted fabric that was cut to shape and that this is why footballers wore and still wear ‘jerseys’, whereas cricketers wore ‘sweaters’ because the traditional cabling meant that in the past they couldn’t be easily made from mass produced knitted jersey fabric. In contrast to jerseys, sweaters, guernseys/ganseys, jumpers were shaped as they were knitted – or ‘fully fashioned’ the term some mills up here in Scotland still use in reference to their more expensive handframed products. And they were more expensive because even when frame or machine knitted, each piece of the finished garment had to be made individually to size. And that this is why the shaping is always done inside the outside edge so that the customer (and anybody who they wanted to know that they could afford it!) could see that the garment was fully fashioned and not ‘jersey-made’. And I was taught in school that this was because the climate in Lancashire was very damp and hence well-suited to the spinning and weaving of cotton. It never occurred to me at the time to question this, even though my Yorkshire cousins didn’t seem to be any less rained on than I was. Of course as I grew older and did start to question things more it became clear to me that the obvious reason was because the raw cotton was landed at Liverpool as a result of the slaving triangle and the Manchester Ship Canal later made it easy to transport it direct into central lancashire. But then it did take a long while for the ramifications of the slave trade to be written back into the history of Liverpool. I didn’t claim that Jersey or Guernsey invented the type of yarn; it is just that those islands were known for producing a very good quality of it in the 16th century, and their yarn was specified as desirable in the records of Queen Elizabeth’s clothing management. The National trust article said: “These items were so well made and highly thought of that on 1st January 1556 Queen Mary Tudor accepted from the Governor of Guernsey, Sir Leonard Chamberlayne, a gift of “wastcotes, sleeves and stockings all of worsted and Guernsey anufacture”.” It is believed that the “waistcoats” were the ancestors of the gansey. Regarding the history of the jersey as a garment: I have the opposite impression from you. I believe that the style of garment was called a jersey because it was made there by the thousands, and as a back-formation from that, the type of fabric got the name. According to someone who wrote to the Times about it well over a hundred years ago, the only difference between a jersey and a guernsey is something subtle in the knitting stitch that would take an expert to discern (and the wretch didn’t say what that difference was). In one of the early 19th century knitting books (Copley, circa 1846 or so, if I recall correctly) there is a pattern for a “jersey” that includes short-row shaping for the back of the neck; it is definitely knitted in the round and at least as fully-fashioned (shaped in the knitting) as most guernseys, which are generally boxy. The terms jersey and guernsey were used interchangeably in the 19th century, though the frame-knitted pullovers bought by the British Navy did tend to be the thin, horizontally striped stockinette shirt that was still referred to as a jersey in the 1950s. Incidentally, I’m told that very fine cotton thread does work up better in a humid atmosphere; it tends to break when dry. Sorry, Tamar, jokes don’t always come over well in writing – I was just having a gentle a poke at the chauvinism and ongoing rivalry between us Northerners on either side of the Pennine hills 🙂 The Yorkshire woollen industry only really started to achieve pre-eminence with the arrival of the Industrial Revolution and I realise that the Channel Islands were well known for their wool industry before this. And I’m sure that what you say about cotton is true but one of the reasons that the Yorkshire textile trade really took off in the 18C was all that water coursing down their side of the Pennine watershed to drive the mill wheels. On the whole the atmosphere in the West Riding is no less humid than in Lancashire and there were some mills spinning cotton to the east of the Pennines so I think that there are a number of factors at play in why the cotton trade became so heavily concentrated in Lancashire, including the availability of a cheap, largely unionised in the early days, female workforce. Potato, potato … let’s call the whole thing off! Also Sue, I am from Lancashire and married to a girl from Woolton Liverpool, and her family has a seafaring background (originally Cornish), so I have found your posts very interesting. What is the first recorded use of the Irish Gaelic term that is not in a claimed-history-of-knitting context? I.e., not as used by Norbury or Kiewe? I’d really like to know, because I suspect it was adopted into Gaelic after it was firmly established in English, since the garment itself was apparently only adopted very late in western Ireland and the name came with it. I love that there can be a serious and educational discussion of Gansey/Guernsey/Jersey and the cotton trade. Gordon – your blog is a great place to be. Oops, just realised that should have read ‘NON-unionised’! The same very much applied to the jute industry in the Dundee area where I now live. Tamar, I suspect you may be correct about Gaelic adoption. Hi Nigel, I know Woolton well – it’s where my parents now live! RE the derivation of the Irish Gaelic geansai, none of the Scottish Gaelic etymological dictionaries I have access to at the moment have an entry for geansaidh (the equivalent in Scottish Irish and normally translated as ‘jumper’. However, I love the fact that due to the adoption of both Gaelic and English as the official languages for the Scottish Parliament, when it came into being they had to create a directory of Gaelic names for places that didn’t already have one. In many instances, this was about resurrecting the original Gaelic name that had become anglicised over the years. However, they took quite a creative approach to it when it wasn’t clear what was the most accurate translation of a non-Gaelic place name and especially those current names that were most probably derived from neither Gaelic nor English in the first place. Waht are my fingers up to?!? That should of course read ‘Scottish Gaelic’ above! Thanks Sue, very interesting. The land of the Jumper! Don’t even go there re the debate about whether Scots should also be one of the official designated languages for use in the Scottish Parliament! We’re talking principles here not practicalities. English is the official working langauge of the Parliament but all documents etc are provided in both languages even though only approximately %2 of the population described themselves as being able read. write or understand Gaelic in 2011 Census. If you ever feel the need to lose the will to live, go delve into the Holyrood archive equivalent of Hansard and search around the issue of ‘simultaneous translation’. On the whole I’m with you re whether Gaelic names should be created for places that never had one and tend to prefer the Welsh approach which is to simply spell the word the way it would be spelled in Welsh in order to maintain the correct pronunciation. So, for example, because there’s no direct Welsh translation of ‘taxi’, nor is there a ‘X’ in the Welsh alphabet, the Welsh for ‘taxi’ is ‘tacsi’. ‘F’ in Welsh is pronounced as ‘V’ and what is pronounced ‘F’ in Welsh is spelled as ‘FF’. So the Welsh for ‘phone’ is ‘ffonau’. I’m not going anywhere near the ongoing debate as to the origin of the word gansey. Belated congratulations on your lovely new home. Perpetual wind aside, it looks perfect.